A set of equilibrium points in a null controllable region is obtained based on an important assumption. A stable equilibrium line is given for DOSs subject to actuator saturation . 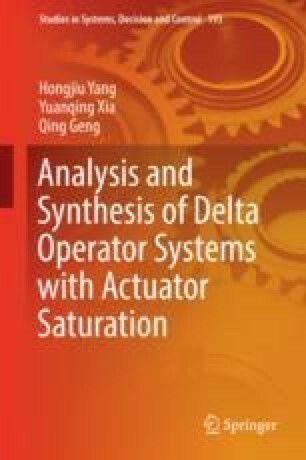 A complex controller is constructed to achieve global stabilization of DOSs with actuator saturation . Our motivation is to get simpler structures of controllers such that the controllers are less sensitive to uncertainties and disturbances of system models than the ones for global stabilization. Therefore, a simple controller is designed to obtain semi-global stabilization of DOSs with actuator saturation . Note that the null controllable region has not been considered in . Moreover, neither global nor semi-global stabilization of states in the null controllable region has not been investigated in . Stabilizability plays a crucial role in all control systems , such as switched linear systems , NCSs , T-S fuzzy stochastic systems, and invertible multi-input multi-output nonlinear systems . Note that high gain feedbacks are essential for semi-global and global stabilization of continuous-time systems subject to actuator saturation. Contrary to continuous-time systems , a high gain feedback taken to research stabilization of discrete-time systems subject to actuator saturation is completely different. In fact, the high gain feedback in discrete-time systems is usually destabilizing. Therefore, a research of the DOSs with actuator saturation is necessary to solve this issue.